“ ‘What are you doing here?’, some people were asking me” says Anton Ivchenko, an activist who took part in a protest in central Yerevan on December 2, the day Russia’s president Vladimir Putin visited Armenia. “I am an ethnic Russian, and people assume I should be happy about Armenia joining the Customs Union” continues Anton, “but I am a citizen of Armenia”. Anton, who describes his political views as anarchist, says that joining the Customs Union, which he sees as a prelude to the resurrection of the Soviet empire, is complete madness. “Understanding this does not depend on one’s ethnicity” he says. “Even some of the policemen understood this”, recalls Anton, who was detained, after he broke through the police lines, waving a black anarchist flag. Protesters took to the streets in downtown Yerevan on the day of Putin’s visit, with revolutionary slogans (e.g. 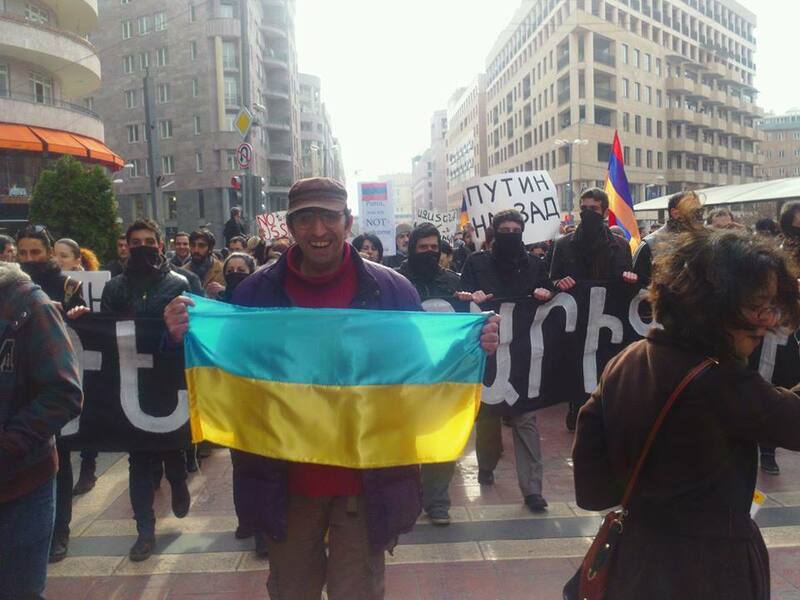 “to the barricades!”) and Armenian flags (some protesters were also holding Ukrainian flags). The number of the protesters was not very high, less a thousand, partly due to police measures. Obviously authorities did not want anything to cloud the Russian president’s visit, therefore from early morning the police started rounding up activists in order to prevent the expected protests. Several activists were taken from their homes, and some were detained while attempting to hang anti-Putin banners in the streets. Olya, one of these activists, says that “as soon as we raised the poster, which said “Serzh’s daddy is coming”, three police cars arrived immediately”. Olya and her friends were taken to the police station for several hours and released when the protests were over: Olya says this is a method police often are use to sabotage protest actions. When, in spite of the detentions, demonstration finally started at midday, the police closed the streets where protesters were marching, scuffles broke out and several dozen activists were detained. On the whole, more than a 110 protesters were detained during the day. Apparently, the mass protests in Ukraine, which inspired some of the activists, also added to nervousness of Armenian authorities. However, police overreaction may have backfired: it turned a relatively small protest into a major news story. Nervousness of Armenian authorities was understandable. Putin’s state visit acquired a special importance in the wake of the September 3 statement regarding Armenia’s willingness to join the Customs Union with Russia, Kazakhstan and Belarus. The announcement also meant that Armenia would not proceed with the free trade deal with EU, which was expected to be initialed at the Vilnius summit of Eastern Partnership. After Ukraine also refused to sign the agreement, the Vilnius summit, which was expected to become a triumph for Eastern Partnership policy, became instead a show of EU’s weakness. Accordingly, Armenia, which only several months ago had been considered one of the success stories of Eastern Partnership, suffered the diplomatic consequences of its sudden U-turn: at the summit Armenia went largely unmentioned at the summit and only a vague statement containing general phrases was circulated on behalf of Armenia and EU. Thus, Putin’s visit was extremely important for Sargsyan, who needed to reassert his positions on the regional scene. He also needed to show Armenian society that the choice to join the Customs Union was the right one, i.e. that Armenia will benefit from it more than it would have from the EU free trade deal. Therefore, the government was particularly happy about the announcement that the Russian gas price will be set at about $190 per thousand cubic meters. However, the gas deal was somewhat tricky: Armenia had to relinquish its remaining 20 % share of the ArmRosGazProm, the formerly Russian-Armenian company, which controls gas distribution in the country. The gas story became even more complicated, when several days after the Russian deal, the Iranian ambassador made the deal look even more vulnerable by suggesting that Iran could have sold Armenia gas at a cheaper price than Russia. As for other economic benefits from joining the Customs Union, Putin vaguely referred to “preferential terms” of Armenia’s membership, but few details were given. As the protest showed, not everyone was convinced of the benefits of Customs Union. Olya, the activist, says “I do not recognize Serzh Sargsyan as a legitimate president who has the right to make such decisions regarding Armenia’s future… if we follow this path Armenia may one day effectively become a part of the Russian Federation”. Political opposition is however, more circumspect in its statements, when it comes to Customs Union, even though they do not hold back from criticizing Serzh Sargsyan. 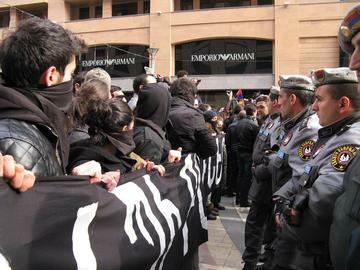 Thus, Armenian National Congress, the party of former Armenian president Levon Ter-Petrosyan refrained from openly supporting the protests, even though some of its younger activists took part in the actions. Besides, there is a consensus across the political spectrum in Armenia that the security cooperation with Russia is indispensable in the current conditions, given the unresolved conflict with Azerbaijan, closed border with Turkey, and apparent impossibility of joining NATO in the foreseeable future. While there are few reliable statistic data, it is obvious that the pro-European attitudes of the young activists, are not necessarily representative of the views of the majority of Armenians. Thousands of Armenian families, especially in the impoverished Armenian regions, depend on the financial assistance they receive from their relatives working in Russia. Russian media continues to be one of the main sources of information on the outside world for majority of Armenians. Russia remains one of the main travel destinations for most Armenians, who do not need a visa to travel to Russian, but have to go through a lengthy and sometimes humiliating process of applying for visas to EU countries. People old enough to remember the USSR often have a nostalgic feeling about Soviet years, and hope that an economic alliance with Russia would bring the benefits they had enjoyed in the Soviet times, such as economic stability and high pensions. Gagik, a driver in his early 50s, who works on a bus route from Armenia to Southern Russia, frequented by migrant workers, is firmly pro-Russian. When asked about the protests, he says: “What’s the point of protesting against Putin, he is the one that feeds us… what would happen if he decides to deport Armenians, who are working in Russia and sending money home? Are the protesters going to feed these people?”. “Armenia is a small country”, says Gagik, “who is going to protect us if tomorrow Azeris and Turks decide to attack? Is it the Europeans? Is it the Americans? No, it’s the Russians”.